When my wife re-entered the teaching ranks last year, after staying home with our young kids for five years, I was once again allowed to live vicariously through a classroom. As an administrator of eight years, I miss the planning and preparing that is part of creating a great learning environment for students. She has been agreeable in allowing me to help her get ready for the students, who are coming in a few days. In this post, I highlight what I would do if I were back in the classroom. Several of these ideas belong to my wife. All of the ideas can create a classroom that is more connected – connected with peers and the teacher, the world, and with oneself. I suggest these ideas through the lens of an elementary classroom. They are general enough that they could possibly be adapted at any grade, K-12. 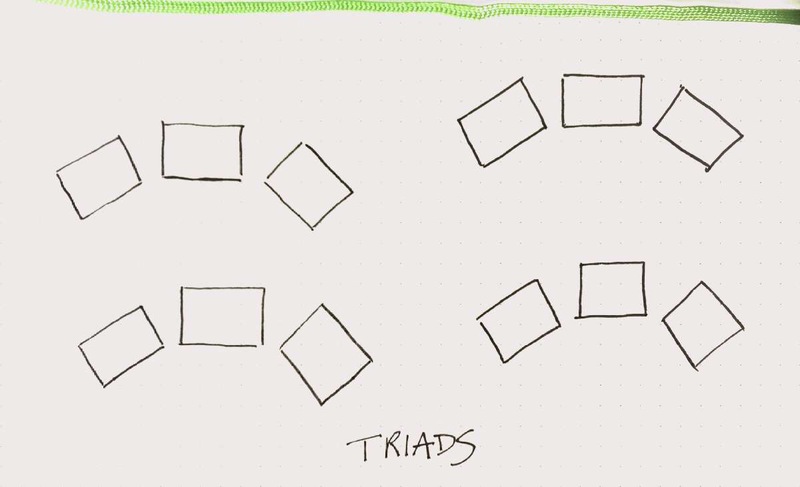 Before the students even arrived, I would arrange desks into triads. I agree with Jack Johnson that three is the magic number. You can use the triad protocol to teach students how to be better listeners and collaborators. Here is my design for how triads would look in the classroom. 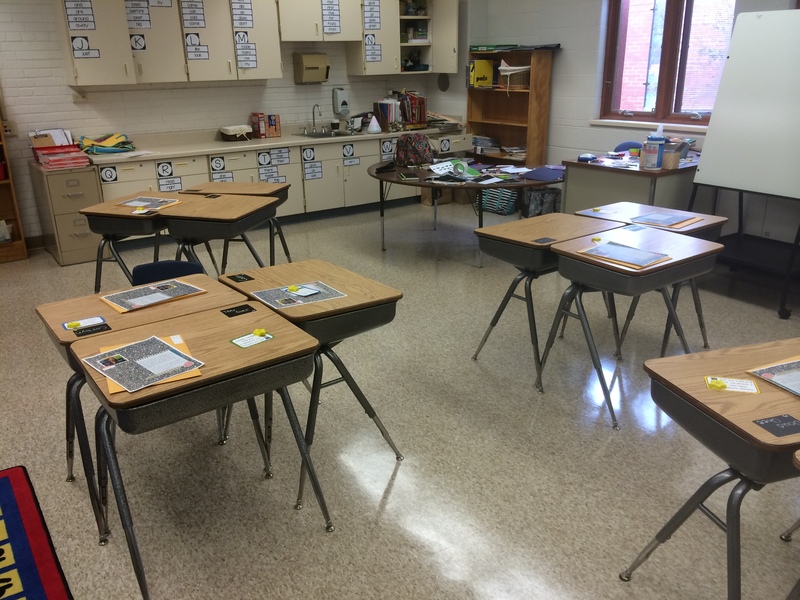 If your room space is limited, consider the three desk set up my wife has in her classroom. Students would start the day with one of three choices: Read, Write, or Tweet. They could read a book silently, respond in writing to their self-selected text in their reader’s notebook, or prepare a question they have on paper, to possibly be posted later on the our classroom Twitter account. I would be explicit in my instruction about how to pose questions, using the format developed by Warren Berger, in his book A More Beautiful Question. – The schedule would be visual, prepared with Keynote, and shared by mirroring the iPad screen using Reflector. It would be shared during morning circle. For my students with various needs, they could go back to this visual schedule on the iPad as needed. – During morning circle, students could do book talks for their peers, using their reader’s notebooks. This would also be the time to post a student’s question on Twitter. We would check our feed for the other classrooms we follow, responding to their questions and comments as a way to model digital citizenship. 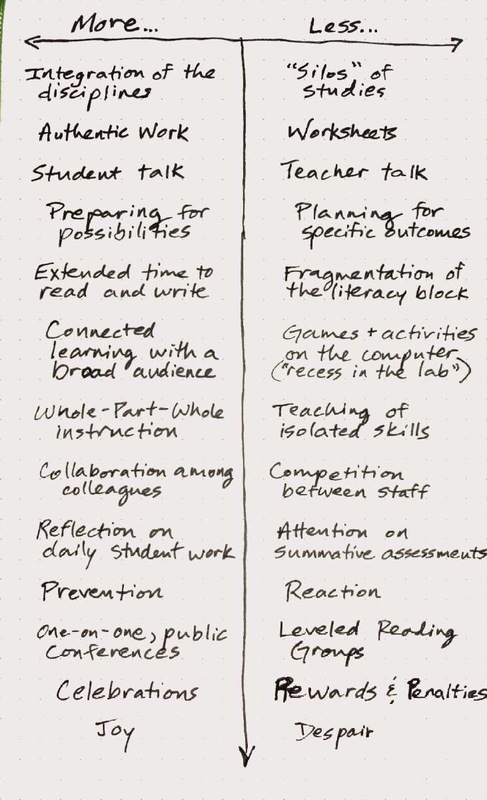 During the literacy block, I would implement the Daily 5 (Boushey and Moser). To capture the learning taking place throughout the classroom, I would utilize Evernote with the iPads in the classroom. 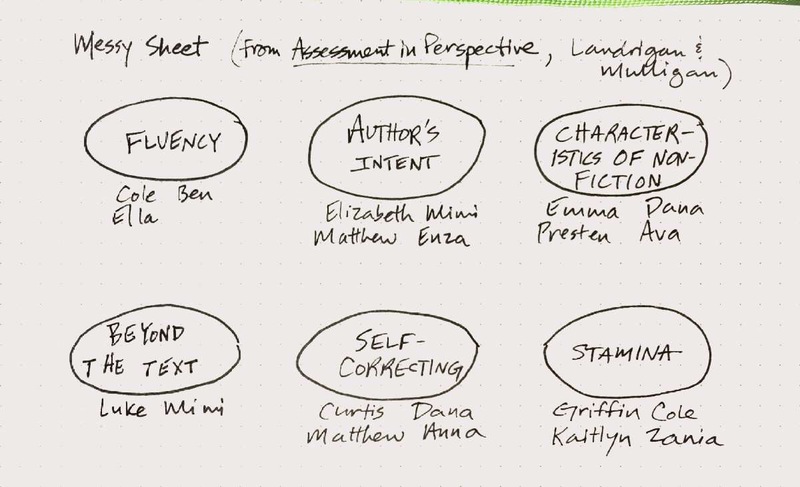 Each student would have a notebook within Evernote to serve as a digital portfolio. – For Read to Self, students would have a note within their digital portfolio. They would use it to keep track of the books they read, a rating of each book, and a list of books they want to read next. Any student could go into another student’s log to find that next great read. 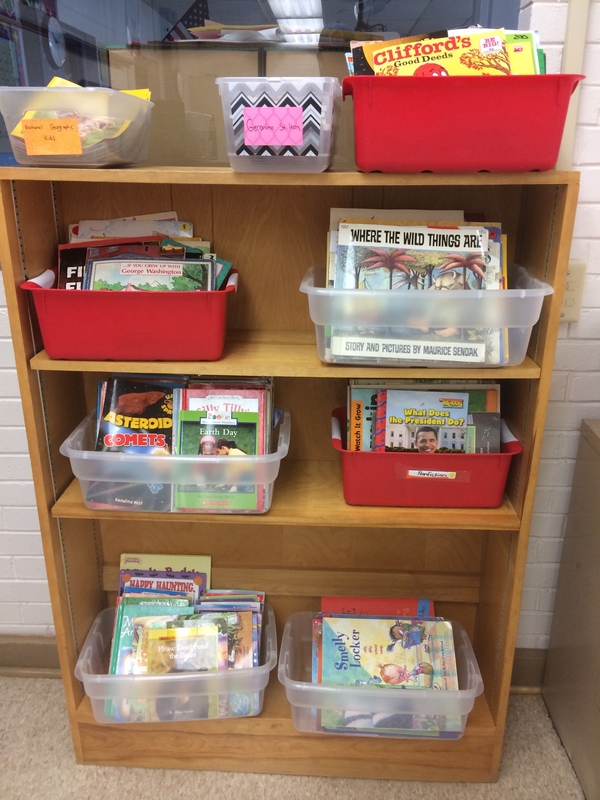 Also important is making sure my classroom library is organized by themes, interests, genres, authors…and not leveled. If a student cannot select a just right book without a level, then it is my fault for not teaching them this skill. – For Read with a Partner, students would have the option to record themselves reading a popular classroom text. Other students who also wanted to read that book could listen to it being read to them, during Listening to Read. – For Work on Writing, students would be taught how to take a picture of their writing with Evernote. Their writing would be held within one note, to show their progress throughout the school year. There would also be the option of blogging during Work on Writing. – For Word Work…well, some learning activities just aren’t conducive for incorporating technology. There are many apps out there to reinforce these skills and build vocabulary. Much of the vocabulary work I would ask students to do would come come from their content studies. As a visual reminder and instructional tool, we would maintain a “Word of the Week” display, using the Frayer model to collectively develop a deeper meaning of the term when time allowed. Beyond the Daily 5, I would also teach students how to conduct literature circles. Students would select texts tied to content in order to integrate disciplines and be more efficient with the limited school day. They would still have choice. Their conversations would also be recorded with Evernote, to be played back after the discussion in order to help them reflect and self-assess their thinking. I would teach handwriting. That’s all there is to it. It benefits learners in numerous ways, no less important than I can read what they wrote when correcting their work. Read alouds would be a mainstay in my classroom. I would start the year with a fun title, something the kids could immediately connect with, possibly the first book in a series. The possible titles would be on display on the first day, available for them to peruse and ask questions. 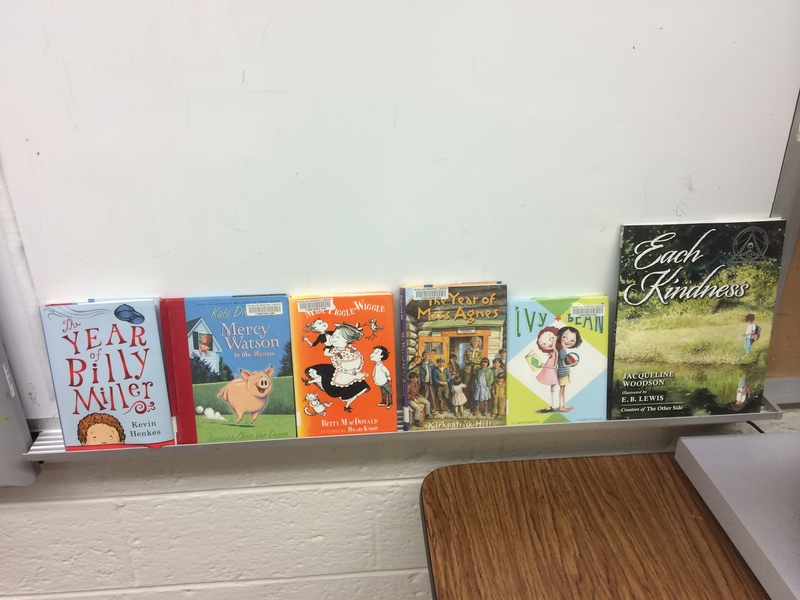 We would vote on the first read aloud, with information supplied by me about each titles. A bonus: I can model how to preview a book during this exercise. – Also of importance is selecting read alouds that represent many cultures, perspectives, and interests. The literature we want to share with our students needs to represent the classroom we learn with and the world we live in. During independent reading time, I would use CC Pensieve, the digital conferring notebook created by the authors of the Daily 5 and CAFE. My reading conferences would take place during independent reading, possibly even pulling in a second student to have them watch me work with a peer, as a way to incorporate a public conference on a much smaller scale. – If I didn’t have the building dollars for this excellent software, I would probably pay for it myself, or use Post-its with Evernote. Each color would be coded to one of the areas of CAFE (Comprehension, Accuracy, Fluency, Expand Vocabulary). 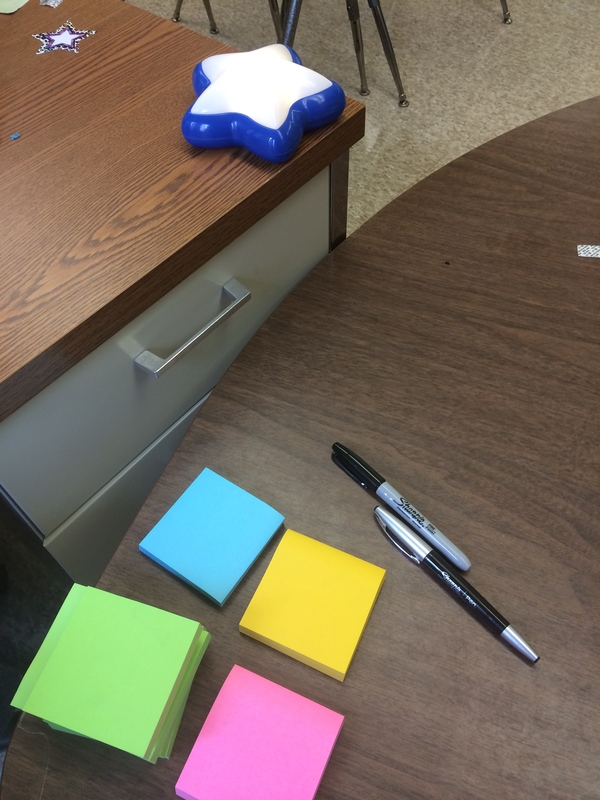 These Post-its would hold questions, progress, and celebration points for each students. They would be scanned into their digital portfolios. When I would prepare for future instruction, I could search my notes based on a specific strategy. This information, combined with more formal assessments, would help me form flexible groups using a “Messy Sheet” suggested by Clare Landrigan and Tammy Mulligan. A poem of the day would be a crucial part of my classroom. I would read it aloud, read it aloud again, and then have the students do a shared reading with me. We would take the time to discuss their initial thinking and delve into the deeper meanings the poet wanted to convey. No technology required. I really like what Eric Marcos has his math classes produce. Students create screencast tutorials about a lesson. It is shared with peers, both during class, and later when it is posted on their classroom website. His work is highlighted in Alan November’s book Who Owns the Learning? Preparing Students for Success in Digital Age. Tools I would consider using for these tutorials include Educreations, Explain Everything, Doodlecast Pro, and iMovie. There would still be demonstrations and modeling by me, but they would be fairly short and to the point, a mini-lesson. 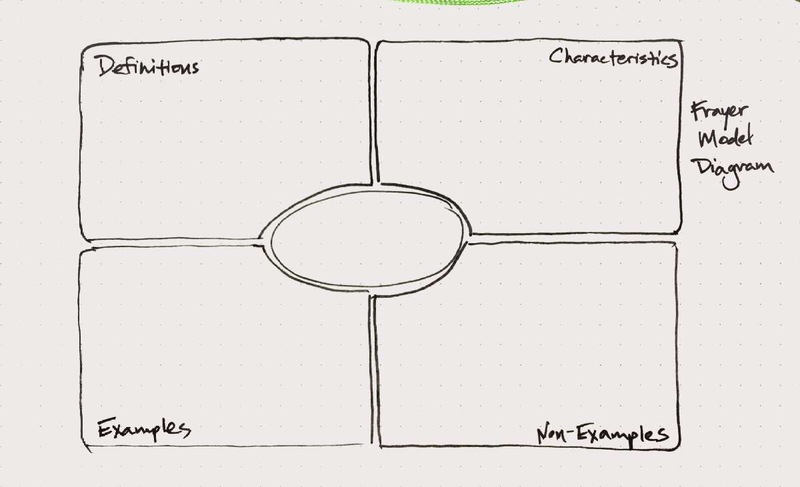 Sometimes I would use a Post-it Note Big Pad to write and doodle what I was demonstrating. These are like anchor charts, but only one foot by one foot. This limited space would force me to keep my instruction brief. I could also record myself teaching, and add both the audio and my visual notes to a classroom blog powered by Postach.io. This blogging tool connects with your Evernote account, published a note within EN. 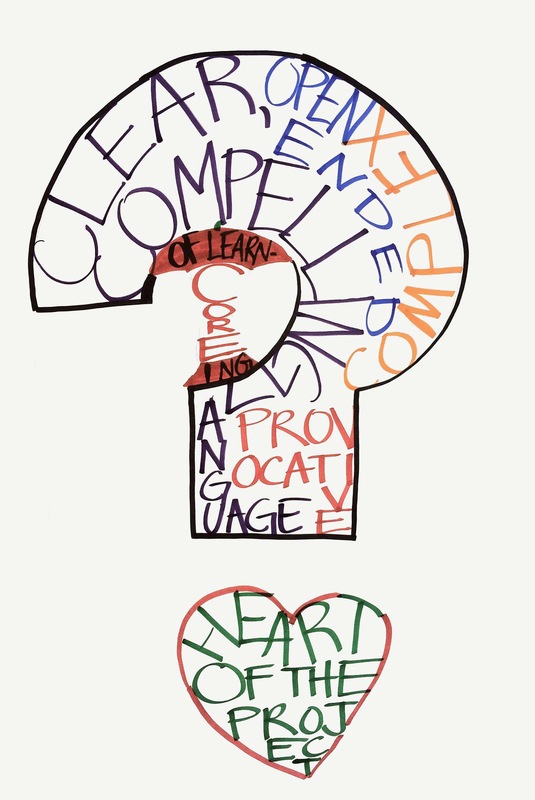 This one is pretty easy – Project-Based Learning. The content areas lend themselves so well to this engaging way to teach. 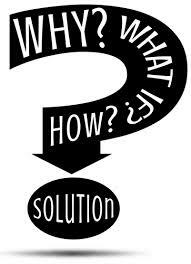 Formally designing curriculum, instruction and assessment around a topic of high interest for students is how I would deliver content instruction every day. The possibilities for literacy and 21st century skill integration is almost limitless. Students find this style of instruction to be most engaging. Maybe most important, this is another opportunity to teach students how to ask a driving question. Similar to mathematics, students would be encouraged to develop formal presentations about their learning using digital tools. They would be shared as a culminating activity, once the unit is done. During closing circle, we would bring up our Twitter feed and see if anyone responded to our posts from the morning. If another classroom or author did connect with us, we would read it together and discuss how best to respond back. At this time, we might also share out the learning for the day via a classroom blog maintained by assigned students using Evernote and Postach.io. Taking these points to reflect on our learning may seem like a waste of time, because it does not seem like we are “doing” anything. But it might be the most important part of our day as a community of learners. Taking time to think about our thinking is essential for solidifying what we know and understand. We would curate all of our tweets and posts using Storify. Students would be encouraged to add comments between each post. Once published, we would email out our learning captured on Storify to parents. In addition, the collection would be reposted on our classroom blog for later perusal. This blog would be embedded within my classroom’s webpage, which would serve as a hub for all of our connections. Having collected all of my parents’ email addresses in my contacts within Google, I would send out a quarterly survey. The purpose would be to assess how well our classroom has connected with families, immediate and extended. The students and I would analyze the results and make adjustments in our communications as necessary. Google Forms seems like the best tool for the job. Each student’s digital portfolio within Evernote would be emailed out to their parents. It would be a reminder to check how their child is doing in school, instead of waiting until Portfolio Night in the spring to find out. I have been asked multiple times how I would teach in today’s connected world. That’s a hard question, because what would work for me may not work for another teacher. With this list, I would take the approach of trying what you see working for you and forgetting about the rest for now. More importantly, it is critical that we always ask ourselves “How will this tool or practice help my students learn and become better people?” Creating a connected classroom is about more than just technology. To summarize this last point, check out this suggested “More of” and “Less of” T-chart. Have a great year of learning! What a busy day! I’m impressed by the amount of technology use you are suggesting. Schools that I have most recently taught in do not have access that would allow what you are describing. Maybe one day soon! The triad protocol is interesting and I love that your classroom library is a collection of books that are not leveled. Readers can dip in at out at different times for different purposes. The use of Post-It notes for demonstrations is great, as is an end-of-day reflection – such a powerful learning tool. You have provided a lot of wonderful ideas here for teachers to implement. Norah, as I reread this post, you are probably right. It is a very busy schedule, chock full of ways to become more connected as a class. The reality is that I would probably not implement all of these things on Day 1, and maybe not all of them at all. For sure, we would gradually introduce many of the ideas, such as student blogging. Thank you for pointing out the reality of the classroom which, try as I might, I do not have the full perspective, as I have been away from teaching for almost eight years. Have a great start to the school year. Thanks Matt. My comment wasn’t meant to express criticism, just awe! Thanks for your wishes for the school year. I am currently out of the classroom as well. This is my third year of writing documents supporting implementation of the new science curriculum, part of the Australian National Curriculum. As your school year is just starting over there. I wish you and your team the best for a successful year. I look forward to reading future posts. I did not take it as a criticism – just an astute observation. Thank you for providing feedback Norah. This might be one of the most thought provoking, concrete posts for me to use as I continue moving into my year. We clearly think very similarly which is helpful for me as I can truly see how to do most of this stuff and cut out some of the crap I do at a less thoughtful level. Thank you so much for taking the time to think this through. I want to write out what I actually do and compare it side by side to make some conscious decisions about my days and how they are spent. Will blog about it and keep you posted. Thank you for the succinct, practical overview-very inspiring. I have curated it as a rare must read to my followers. I was wondering why triads? Thanks Bret. Groups of three have a lot of advantages. First, participants can make eye contact with each other more easily compared to pairs. Second, the teacher can be pretty strategic about seat assignments. My preference is to place one high-achieving student with two other classmates, and to ensure diversity in each group when possible. Third, having three desks together provides a set up to conduct a mini-public conference, where one student watches the teacher and another student during a reading conference. I don’t think there is anything bad about groups of four, maybe just a personal preference. What is more important for cooperative learning is that there is individual accountability and group goals. I love all of the ideas that you have listed in order to stay connected. I’m learning how to integrate technology into my teaching, but it’s definitely not daily. I think I would have to take one item on the list and work on that one action for awhile before moving onto another item on the list. I love the way that the students can make notes of the books that they read in a digital portfolio and how other classmates can check out their book ratings and what they thought of it. As a reader, I always look at what rating others give books I’m interested in before reading it. The students pay closer attention to what their peers think and say rather than what the teacher does. I also like how you could send everyone’s digital portfolio by email to the parents. I think many parents nowadays pay more attention to things sent by email rather than the paper work we send home in their weekly folders. Thanks for the posting. Thank you for this great post! I’m wondering what you might think about inviting virtual guest speakers into classrooms to help engage and excite kids in several of these topics? Currently, I’m working for a small edtech company that is trying to connect K-12 classrooms to virtual guest speakers. Our company, United Teach, has lots of inspirational people signed up to (virtually) speak to K-12 students, including children’s book authors, financial planners, astrophysicists, and even veterinarians. Given your expertise in integrating technology into the classroom, we would truly love for you to check us out at unitedteach.com, and send us your feedback. We love the idea of creating a more connected classroom, and can’t wait to hear from you! Lara, thank you for sharing your resource here. Just found your blog through an article on the two sisters website and I can’t wait to read through your posts. I am currently trying to get iPads for my classroom through business sponsor/partnerships. I know I will make it happen and I can’t wait to start integrating technology on a daily basis and really get the kids excited about learning and to take charge of their education. Thank you, and good luck with your integration of technology in the classroom. Matt, I am teaching Kindergarten, but have taught all grades. I have read over this post three times in two days. I keep thinking how I can incorporate some if this learning into a level that would fit with Ks. This is such a such a good post on using technology on all levels. My school does not have much as far as technology. We are many moons behind most counties. I do write grants which helps. I also let two students at a time use computers. We do not gave a Smartboard, but I have a wireless mouse and a LCD projector! Thanks for this post. I have saved it as a PDF so I can keep referring to it! Pam, the nice thing about kindergarten is so much about the connected experience can be modeled by the teacher. You can do a lot with only one computer in the classroom. I highly recommend connecting with kindergarten teacher Matt Gomez (http://mattbgomez.com/) for more information on your situation, if you have not already done so. Thanks for sharing! Matt, what are your thoughts about homework? How do you see it working in a ‘connected classroom’ such as the one you describe? I use many of your ideas already and I am going to include a daily poem this year. I teach 10 year olds (in NZ).